Chang Yiu-chun taught and practiced 12 brief knife fighting techniques using a small single edged knife with a larger handle. He was the supreme knife fighter even into his eighties and he attributed his prowess with the blade to these 12 exercises. Advanced, because one must have basic skills in order to practise these methods. However, even if you do not, these drills will give you those necessary skills like knife handling and what Chang called 'slight of hand'. He would have the knife in one hand and you might think that he was going to attack with a certain movement, but the knife would be in your temple before you knew it! These 12 methods will give you all that is necessary to fight with a knife in any situation against one or multiple attackers. Best not to be there in that situation in the first place of course, however, if you are, then you will have the necessary tools to at least give you some chance of survival. Not only hand work is taught but also very precise and quick footwork is taught, evading here and re-attacking there etc., The names of each form give some idea of what is covered like: "Bending Knife" or "Fast Moving Feet Knife" or "Reverse Knife" etc. 12 of them because each is loosely based also upon the 12 main acupuncture meridians in the body one after the other beginning with the lung meridian. 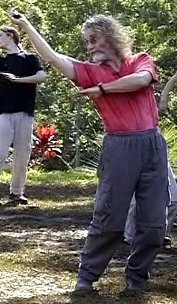 Each knife form as a Qigong method done quite slowly paying attention to each minute movement, thus having an affect upon its particular meridian and also teaching exactly how to perform the form at its explosive pace. By doing it slowly, we learn exactly how to position the body so that we maintain the upper hand at all times, the footwork is very important also, and doing the forms slowly we learn exactly how to move the feet and weight. Then we learn the forms faster and faster keeping in mind that we must never lose the movement for speed, until we can perform each form at a fa-jing level explosively as this is the only way to fight using a knife against a knife attack. recently when teaching the 2nd two forms at Camp 2003, many of the participants were having difficulty getting one particular movement where we move from an 'ice pick' type of attack by rolling the upper body as if drunk, turning to the East and attacking up under the attacker's arm to HT 1 point. What they weren't seeing was a dropping of the weight as this occurred thus giving reverse power to the attacking hand.Each form can also be performed on the reverse side as the knife is always held in the right hand only. Although you can get balance by doing the slow form on one side and the fast form on the other side. If you want something beautiful, powerful exotic, healthy and deadly to teach your students, then you cannot go past the 12 Knife Fighting Techniques.